We’re all pretty aware of the stereotypes that surround Portland, Oregon. 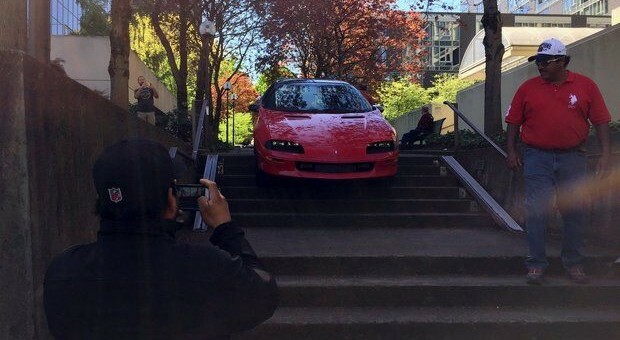 But despite the city’s outside-the-lines style of thinking, cars like a fourth-generation Chevrolet Camaro are simply not designed go down a flight of steps, no matter what the pseudo-science websites try and tell us. We’re only kidding of course, we know that the part doesn’t represent the whole. But what we don’t know is how the driver managed to get into this predicament. According to the fellows at LSXtv.com, Google Street View shows that there are even bollard posts in place to prevent things like this from happening. They mention that this same incident had happened last April as well, with a Toyota Camry ending up in the same position. Maybe it’s just humans being humans, but we have a hunch that perhaps the incident’s proximity to a certain holiday that is quite popular on the west coast could have something to do with it. Though we also should consider LSXTV‘s theory, maybe Portland’s just plain weird.